Ken Lewis of the production team The Skywalkers got in touch with yours truly for help in making his MIDIs sound “real”. With at least 50 #1 hits under his belt, Ken is great at getting the sound he is looking for, and he needed an extremely fast turnaround time and lots of options. 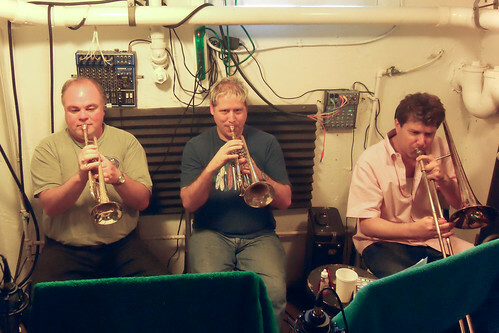 Trumpeter Tony Gorruso accompanied me to Ken’s home studio and the three of us arranged the tracks at top speed, aiming for a deep monster brass sound. “I basically sampled some of your samples (lol) and made brass ‘hits’ of my own” is how engineer Carole Wolf described incorporating the New York Brass free sample library into her recent work. 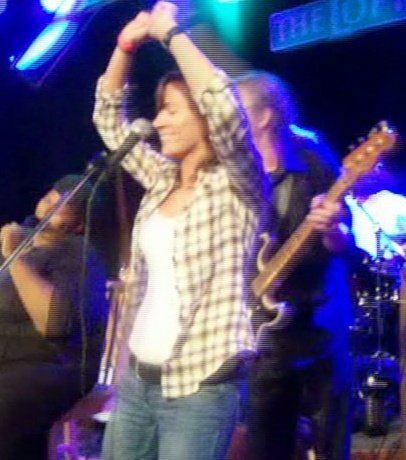 Carole did the pre-production at home, and the rest of it was polished and tweaked at The Loft recording studio in Columbus, Georgia. She thoughtfully emailed us a completed track. What you are hearing is the swooning Neo-Soul vocals of Nesrin Asli along with MC Cyryus, Kevin Lamar on drums and acoustic guitar by Marshall Ruffin. Oh – and brass comes from here – which Carole has layered-in with utmost delicate subtly. I love how Nesrin’s electrified voice climbs up and down the easy the walking beat. We are please to have contributed to this fabulous sound. Can you tell we forgot to take a picture during the actual recording? Don Downs, Tony Gorruso and Your Truly recorded for Israel Lamm and Nochi Krohn on Friday aboard the USS Nimitz. Ha-ha. No really, it’s just my studio. We’re sitting in front of two personal mixers which are part of the studio’s really cool personal monitoring system that I’ll blog about in the near future. We look a little self-conscious here. Maybe it’s because none of us are wearing earphones as we would during an actual recording. I forgot to take a picture until we were nearly done, and said “look natural” on the ten-second dash back to my chair. From here, Don left to play for La Cage Aux Folles on Broadway and Tony headed to West Side Story. When I’m not brassing things up at NewYorkBrass.com, fixing computers or inventing new microphones, every now and then I like to do this too. 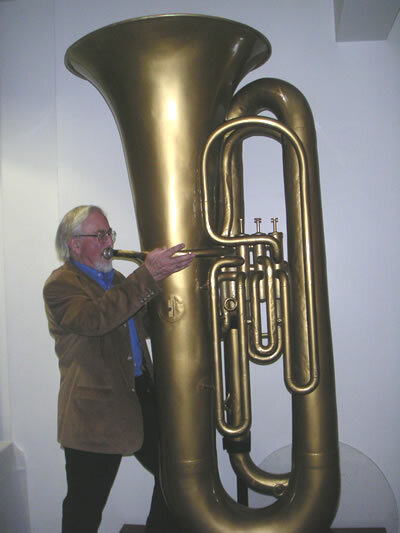 How to make a trombone! If you have ever wanted to MacGyver your own trombone at home out of some scrap copper, shoe laces and a box of thumb tacks, this is your opportunity. I found this Discovery Channel documentary that is specially tuned so all you DIYers out there can participate. R&B recording artist Steph Newton incorporated samples from our totally awesome free sample collection in a recent song “Outta My Depth.” You can find this track on her new EP ‘Everything You Need’. Sounds great! Have you used any NewYorkBrass.com free samples in songs? Tell us about it! 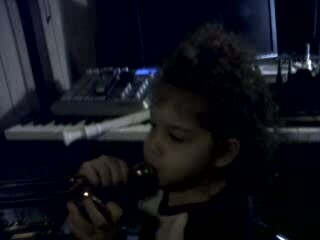 About a year ago my (then) two year old daughter Maya came to the studio and decided to try out the trombone, sorry trumpet (“No Maya, It’s a trumpet” “yes trumpet”) . Ring ring … Hello? Pomegranate? We had a great time back in December recording the brass used in the commercial for the Brooklyn-based supermarket chain Pomegranate. (See below). 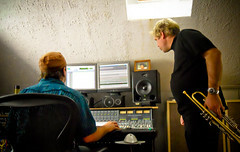 Notable composer Yossi Green authored the basic track, Eli Lishinsky (platinum producer – Mary J Blige) arranged it in MIDI, and then it was shipped to Yours Truly at Newyorkbrass.com for final brass arrangement before laying down the vocals. 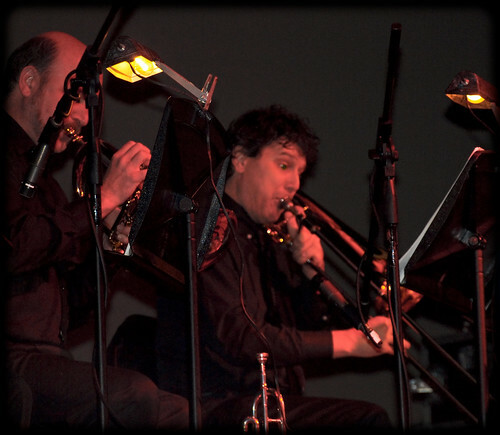 Nolan Jackson, EvanAL and NewYorkBrass…. Wouldn’t it be cool to have one of these? A. Where can I get one? B. Anyone have info on who what when where this photo was taken? Awesomeness…. Hey I think this is a cool pic! 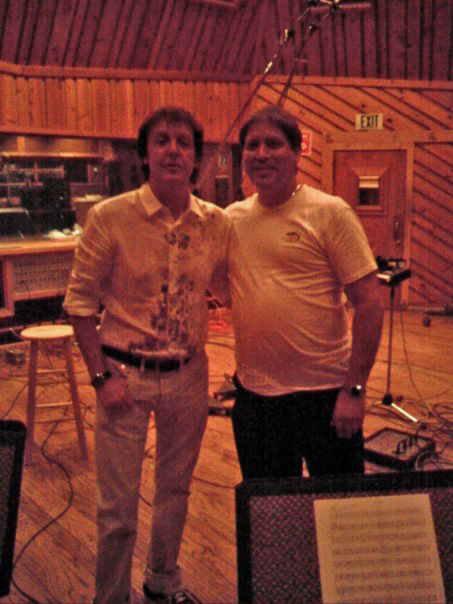 Tony Gorruso was recording for James McCartney’s upcoming CD. 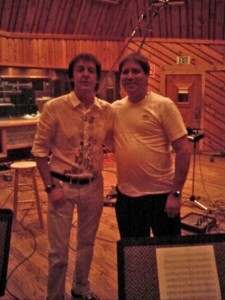 Sir Paul was there assisting/co producing the production. The session was at the famous Avatar Studios at 441 W. 53rd Street in Manhattan and Rick Depofi did the horn arrangements. At the intermission Tony asked if he could have his picture taken. He was lucky – seems Sir Paul tries to avoid taking pictures with the comoners. Now I need a picture like that too.